The Oregon Ducks have revolutionized the way that college football is played, and for almost 10 years now, the Ducks have been the most entertaining team to watch. 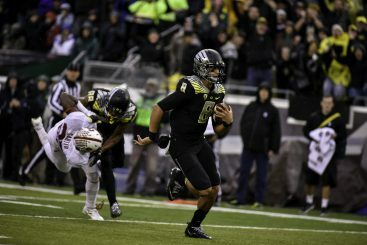 Oregon’s no-huddle offense, comprised of speed, great athletes and misdirection, has influenced many programs across the country. Chip Kelly, who is currently the head coach of the Philadelphia Eagles and one of the most successful coaches Oregon’s history, won 46 games, including two bowl games, during his four-year tenure as the Ducks’ head coach. Kelly’s Ducks averaged 44.6 points per game from 2009-2012. Although Kelly bolted for the NFL after the 2012 season, his successor, Mark Helfrich, has kept the tradition alive. Since Helfrich took over the reins in 2013, the Ducks have posted a 24-4 record, and they’re still scoring at an unbelievable pace. But what has been Oregon’s secret? How has the program maintained an offensive edge for nearly a decade? You can point to a lot of things, but one thing is clear: Oregon has had a lot of offensive weapons over the years, and its receivers have led the way. 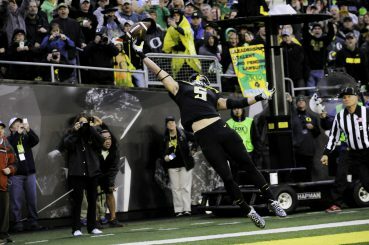 According to Dale Newton of duckstopshere.com, he believes that the Ducks current receiving corps has a chance to be one of the best — if not the best receiving group — that the program has ever seen. Devon Allen is expected to be an important piece for Oregon’s offense next season. Newton certainly has a point here. 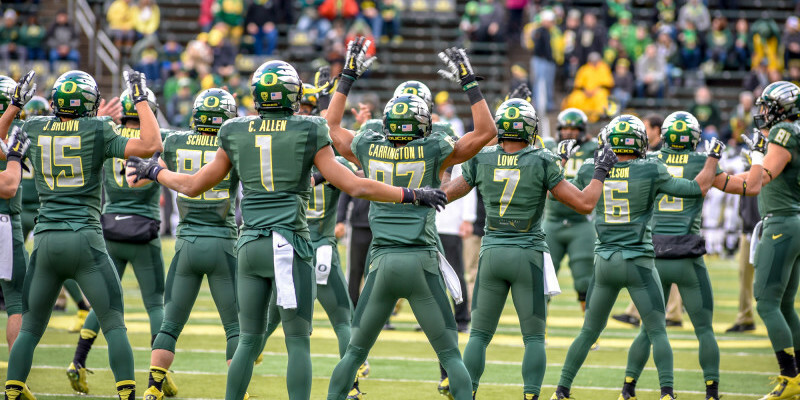 Oregon will enter the 2015 season with a plethora of playmakers. Byron Marshall, Darren Carrington and Dwayne Stanford combined for 2,346 receiving yards and 16 touchdowns last season. Also, assuming that Devon Allen, Pharaoh Brown and Bralon Addison are healthy, Oregon will be a lot more explosive with them on the active roster. However, there is a very important question that has lingered for quite some time now: Who is going to be the Ducks quarterback next season? Oregon’s coaching staff hasn’t really answered this question with much clarity, but can you blame them? It will be impossible to accurately gauge the situation until Vernon Adams, who is graduating from Eastern Washington University and transferring to Oregon as a graduate student, arrives in Eugene this summer. Marcus Mariota will be remembered as the best player that the program has ever seen. The Ducks certainly lost some key players after the season ended back in January. When you consider how important Mariota, Hroniss Grasu, Jake Fisher and Hamani Stevens were to the team’s success, it’s going to be tough to replace them. But the Ducks have always had a unique mentality that includes selflessness and sacrifice. Helfrich and the rest of the coaching staff believe in what they’re doing, and the players have bought in, as well. Sure, the Ducks will miss their all-Americans, especially Mariota, but Newton thinks they will have enough talent to continue their success this season. What’s great about sports is that each year is different. There are new story lines, new players and new questions to ponder. The Ducks will have some new faces next season, but plenty of their primary playmakers will be back and as explosive as ever. So, will this be the best receiving corps that the Ducks have ever had? Who knows? But it’s going to be a lot of fun to watch.